The suspense short story, invented by Edgar Allan Poe, and perfected by Guy de Maupassant, has become one of the most popular forms of literature. 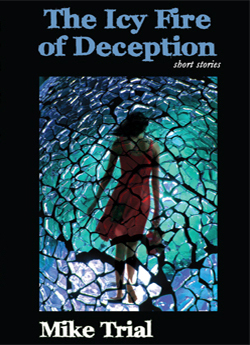 Icy Fire of Deception gives us eight tales to chill the blood. In Free State, Annifrida must confront a murderer living on an ancient oil platform in the middle of the North Sea. In Cold Cargo we find an airliner in flight with a dead man at the controls. In Stolen Melody a musician finds a fragment of brilliant classical music by a world famous composer, but instead of giving it to the world, uses it to make himself rich and famous. For a small nation in West Africa, oil production is a blessing that boosts the economy. But it turns from blessing to curse when an unscrupulous political insider decides to control the oil supply himself, using a Russian submarine. A theft of cash from a stylish San Francisco cosmetic surgeon’s office has no suspects – except a man who died before the theft was committed. A tanker full of oil is a floating multi-million dollar investment – and a target for pirates. This time the pirates threaten to not only destroy the ship if their demands aren’t met, but cut off Asia’s oil supply entirely.